If you are looking for Olympic Style Judo in Port St Lucie, Self Defense Judo, Kosen Judo, or just to learn this awesome martial arts and self-defense system used by Japanese police officer and many mixed martial arts fighters in the Ultimate Fighting Championship (UFC) You have come to the right place in St Lucie County, FL. Our Judo classes and training are perfect for kids and adults. Learn Judo in PSL With Judoka Black Belt Lucas Morley. His style mixes both with the Brazilian Judo and Russian Judo. Training in this art style takes time and dedication, especially if you train for a spot in the Judo Olympic team. When you train at the right place, it becomes so much easier for you to progress. You will notice that when you learn this martial art at our Brazilian Vale Tudo Mixed Martial Arts Academy in Port St Lucie. 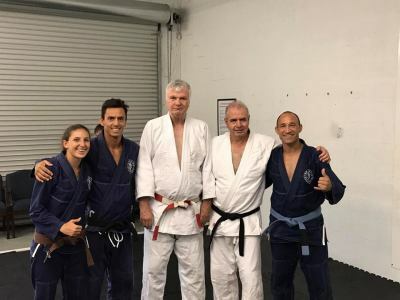 Learning the arts of Gracie Jiu Jitsu or BJJ, Muay Thai boxing and submission wrestling is key in becoming a talented mixed martial arts fighter. Mastering elements of other martial arts disciplines can improve your skills and increase your fighting arsenal in a self-defense situation on the streets or in the MMA cage. Learning essentials of Judo can radically increase a mixed martial arts fighter’s chances of winning a fight. Judo is a Japanese martial art created by Jigaro Cano. The word Judo means the “gentle way.” It has more than 67 throws and variations. The object in Judo is to use certain moves, to throw an opponent to the ground and then hold them down with a pin, armlock, choke hold, or any other submission. Punches and Kicks are a part of Judo, but only some schools teach these. Some gyms only teach Olympic style, which lacks the strikes of Judo. In mixed martial arts, the Judo moves can be used freely and also most strikes. Prior to WWII this martial arts was a complete fighting system. Here at the Brazilian Vale Tudo Academy we still teach the complete Judo. The primary focus in Judo is takedowns, throwing and groundwork. To take your attacking opponent from a standing position, which is where all self-defense confrontations begin, to the floor. Judo uses falls, like forward fall, backward fall, side falls, throws, rolls, hold downs also known as pins, submissions also known as joint locks and strikes in a quest of the throw and the submission. In Judo, there are two main phases of the fight, the Nage Waza or standing phase, and the Katame Waza ground phase. In the Katame Waza, opponents try to throw each other down to the ground. Some submission holds and joint locks can be used in the Katame Waza, but these are often hard to execute and lots have been banned in Judo competitions. Judo practitioners are skilled in takedowns with submissions following up after their throws. Strikes are not allowed in Judo competition because they are certain to injure the opponent, but they are highly used in self-defense. In the standing part of Judo, the main goal is on throwing the opponent to the mat or tatami. When you perform the throw in a proper way, this will place the fighter that threw the opponent in a dominant position. With the amazing throws from Judo when a perfect throw is executed, an opponent body will have a slight shock of impact once they hit the ground after the throw, thereby causing him to submit. In Judo, a well-executed throw can win a match by ippon. In mixed martial arts, the fighter still has to get the opponent to submit, using a submission technique. These techniques are taught in the Ne Waza part of Judo as well as in other forms of Combat Sambo, Brazilian Jiu Jitsu, Vale Tudo and Martial Arts. Arm bars, Chokes, and other submissions are used to make the opponent to give up in Judo, Self Defense and Mixed Martial Arts. Judo, while a martial art, became a competitive sport during the last century and many gyms have gone away from teaching the “real” arts that offer a lot more moves then they are allowed in competition. Judo was introduced to the Olympics games in 1964. As a sport, Judo has weight classes and rules of the competition were in the street, you never know how big or small your opponent may be. Skillful Judo player have competed in mixed martial arts bouts and have achieved success, people like Ronda Rousey, Karo Parisyan, Hector Lombard and many more. When training for MMA, adding the Judo techniques can really give you an edge in the fight. Those competing in the sport of MMA, see learning Judo as part of a Brazilian vale Tudo Self Defense System program and really advantageous to their end goal. Why not get all the benefits of learning judo at our Mixed Martial Arts Academy location at Port St Lucie, Florida. Call us NOW for a 30 Days FREE Trial 772-626-6500.